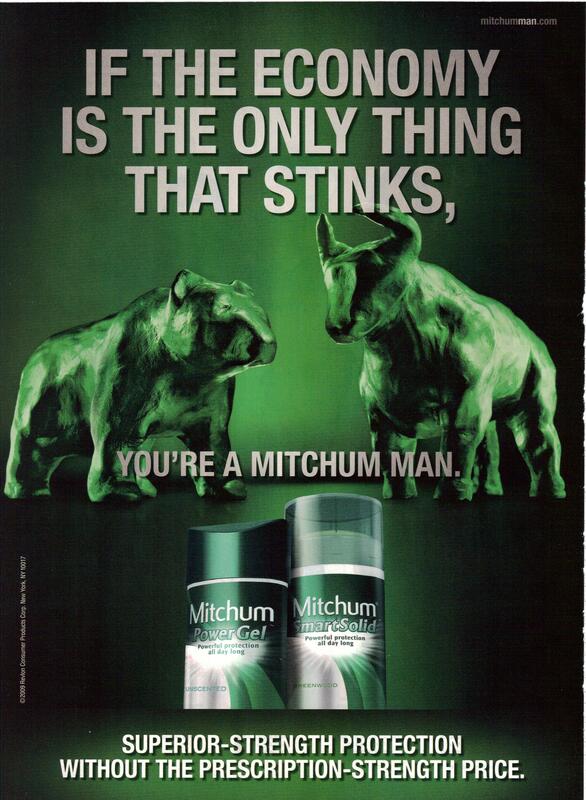 This is an ad for Mitchum deodorant and was found in a men’s magazine. This ad feels like it’s very timely, but I wonder if it’s not something that you would find nearly any time. What I find most odd is that it not only suggests that this deodorant will ensure that the man who uses it doesn’t stink like the economy, but also that anyone who does not use this deodorant will stink. That’s quite a claim. This is a visually interesting ad, but I think that the way the text is phrased kind of bothers me. It’s one thing to claim that your product works better than the others, another to claim that they don’t work at all. This entry was posted on December 30, 2009 at 12:00 pm	and is filed under Beauty. Tagged: deodorant, mitchum, print-ad. You can follow any responses to this entry through the RSS 2.0 feed. You can leave a response, or trackback from your own site.